No other diplomatic event in recent years has benefitted Prime Minister Abe Shinzo more than the G7 Ise-Shima summit held on May 26 and 27. G7 summits held annually since 1975 (transforming into the G8 and back) have rarely been occasions to make historic decisions; they are more often occasions for the leaders of the seven industrial democracies to review and discuss pressing issues and increase their mutual understanding. Not just leaders but bureaucrats of the G7 countries compare notes and agree on an almost endless list of global issues facing their countries. And this year, in addition to the summit, eight ministerial meetings—foreign, finance, agriculture, ICT, energy, education, environment, science and technology, and finance—were also held in various parts of Japan from April to May. Abe, as the host of this entire diplomatic roadshow, must be satisfied by the fact that all meetings were successfully concluded without any accidents including terrorist attacks. He staked his reputation on making this a memorable event, and the coverage amply rewarded his strong commitment. More satisfying for Abe was the historic visit of President Barack Obama to Hiroshima immediately after the G7 summit on May 27. 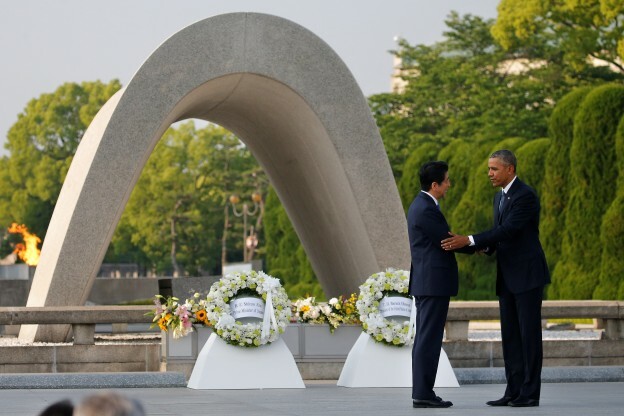 Obama’s plea for “a future in which Hiroshima and Nagasaki are known not as the dawn of atomic warfare but as the start of our own moral awakening” was overwhelmingly welcomed by the Japanese and Americans, and, for Abe, standing beside Obama, their presence in Hiroshima proved the strength and maturity of the Japan-US alliance and the successful conclusion of the G7 Ise-Shima summit. Given the fact that no previous US president would visit this city and recognize the calamity that befell it, Abe received credit for Obama’s decision. Russia is now a problem to be discussed in the G7 summit process rather than a member of the G8 summit. G7 leaders “reiterate [their] condemnation of the illegal annexation of the Crimean peninsula by Russia and reaffirm [their] policy of non-recognition and sanctions against those involved.” Russia, however, is an interlocutor for Japan in its efforts to resolve the territorial dispute over the Northern Territories. Abe seems to believe that if there is a slight opportunity to resolve the territorial dispute between the two countries, it exists only during the tenure of both Putin and himself, in the period when both Russia and Japan are under strong political leadership. Abe needed to seek the understanding of the other G7 leaders that Japan’s attempt to pursue negotiations with Putin would not contradict the common stance of the G7 with respect to Russia’s behavior in Ukraine. Abe also needed to persuade Putin that Japan’s common stance as a member of the G7 against Russia on Ukraine would not contradict its efforts to continue to engage in negotiations on the territories. This writer believes that it is extremely hard to bring about a territorial deal mutually agreeable to both Japanese and Russians but during the G7 process Abe at least succeeded in creating an image that Japan was not an odd man out in the G7 summit on Russia despite the fact that he met with Putin in Sochi just a few weeks before the G7 gathering. Although not widely reported in the international media, one of the functions of the G7 summit process is to present various proposals as advanced industrial democracies to the multilateral international discussion more officially sanctioned by such universal organizations as the United Nations. For example, at the 2000 G8 Okinawa summit, Japan put the issue of infectious diseases on the G8 agenda for the first time, launched an “Okinawa ID (infectious disease) Initiative” and insisted on the necessity to build an international partnership to raise funds to tackle infectious diseases. The agreement at that summit became an impetus in the global discussion that eventually led to the establishment of the Global Fund to Fight AIDS, Tuberculosis, and Malaria in 2002. 17 million lives have been saved by the works of the fund, according to its 2015 report. The Ise-Shima summit was significant in this sense as it was the first G7 summit after the adoption of the “2030 Agenda for Sustainable Development” and the Paris Agreement on climate change in 2015. The G7 as a whole and Japan as its host could utilize the summitry as a launching pad to promote policies that affect global agenda. Abe, among many global issues, gave priority to three areas: health, women, and infrastructure. Although it is not much known in the international as well as Japanese media, gender is an important issue for Abe. In his addresses to the UN General Assembly over the last three years, Abe emphasized the importance of the protection of women in conflict situations and the participation of women in the process of resolving conflicts. He also recognized the critical importance of women’s participation in Japan as part of Abenomics. He has made efforts to appoint more women to high-ranking government posts and encouraged the private sector to increase the ratio of female board members. He hosted the World Assembly for Women (WAW) in Tokyo in 2014 and 2015 to gather together world female leaders in a wide range of fields partly to stimulate discussion in Japan, which is lagging behind many other countries in such indicators as the ratio of females to male in parliament, and the percentage among entrepreneurs, scientists, and so on. Abe’s insistence on the inclusion of gender as an item for G7 discussion was also motivated by his domestic policy agenda. Facing growing competition from industries of emerging economies such as China in infrastructure development, the G7 decision to emphasize “quality” is also consistent with the interests of the infrastructure business in these countries, while the principles are necessary to achieve sound development in line with the 2030 Agenda. Insertion of “quality infrastructure” into the G7 document was useful for “Abenomics,” too. Overall, the G7 summit was a useful foreign policy instrument for Abe’s domestic purposes. He maximally utilized the summit and Obama’s visit to Hiroshima in propping up popular support for his government. Most obvious for this purpose was Abe’s discussion of the state of the world economy. The most pressing domestic economic policy for Abe has been the issue of whether or not to postpone raising the consumption tax from the current 8 percent to 10 percent next April. Abe postponed the increase once already as it might decelerate economic growth; he promised not to postpone again in the Lower House election campaign of December 2013, in which the LDP (Liberal Democratic Party)/Komeito ruling coalition won a two-thirds majority. He had maintained that he would not postpone the increase unless the world economy is hit by a crisis such as the Lehman crisis of 2007 or Japan was hit by a crisis such as the Great Eastern Japan Earthquake. Abe in his discussion with the G7 leaders emphasized the downside risks of the global economy and argued for making efforts to prevent a crisis like that of 2007. Saying after the summit that the leaders had reached a similar understanding of the world economy, he announced on June 3 the decision to postpone the increase of consumption tax. With the success of the G7 summit, Obama’s historic visit to Hiroshima, and the understanding by the global leaders of Abe’s economic policy, Abe now enjoys a renewed increase in his approval rating (56 percent in Nikkei’s poll) and is ready for the Upper House elections in July.